One Year Later, Did Nintendo Keep Their E3 2013 Promises? Now last year, Nintendo didn't have a traditional E3 briefing. No stage, no live show. 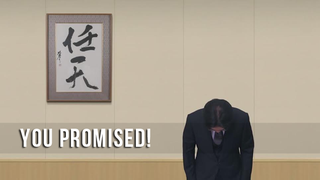 Just a forty-minute Nintendo Direct video, filled with Iwata, footage of games... and promises. Not as many as we've seen up to now, but promises nonetheless. One Year Later, Did Microsoft Keep Their E3 2013 Promises? Nintendo's tightly-packed presentation was basically a long string of upcoming games, for the Wii U and the 3DS alike. Let's have a look. The Promise: Pokémon X and Y will launch worldwide on October 12, 2013 for the 3DS. A new Fairy Pokémon type will be present, along with Pokémon-Amie, a new minigame for becoming friends with your Pokémon. True? Yes. Available on time, with the Fairy type and Pokémon-Amie intact. Here's our review of the pair of games. The Promise: Coming to the Wii U in December 2013 is Super Mario 3D World, with the added bonus of a local four-player multiplayer mode starring Mario, Luigi, Peach and Toad as playable characters, and a brand new Cat Mario powerup. True? Indeed—in fact, the game arrived a bit early, on November 21, 2013. The Cat Mario powerup was in, and there was even a fifth unlockable character. We have a review for you here. The Promise: Mario Kart 8 will launch on the Wii U in Spring 2014, and it will have a nifty anti-gravity mechanic. True? Yes, Mario Kart 8 did have anti-gravity sections when it launched on May 30 a few days ago. Our review is right here. The Promise: Wii Party U will be released in October 2013, and it will feature at least 80 minigames. True? Wii Party U came out on October 25, and not only did it have 80 minigames, but it also had board games that were playable on the Wii U GamePad. The Promise: The new Wii Fit game for the Wii U, titled Wii Fit U, will launch in December 2013. True? Yes, but in a kinda strange way. A trial version of Wii Fit U was released on the Wii U eShop on November 1, 2013, which was actually a version of the full game that you could download and play until it expired after a month. But, you could also buy a Nintendo Fit Meter and register it with your downloaded trial copy—that way you could keep playing for as long as you wanted. The full retail version of Wii Fit U was eventually released on January 10, 2014, and the trial promotion expired on January 31. The Promise: A new Art Academy game is in development for the Wii U, but it's a long way off. In the meantime, an Art Academy app will be released for the Wii U GamePad in Summer 2013, which will let players share color drawings on Miiverse. True? There are still no news on Art Academy for Wii U, but the GamePad app, called Art Academy: SketchPad, was released on August 9, 2013. The Promise: The following fourteen third-party games will launch on Nintendo's consoles before the end of 2013. Assassin's Creed IV: Black Flag: Released on time for the Wii U on October 29, 2013. Batman: Arkham Origins: Released on time for the Wii U on October 25, 2013—though it had no multiplayer mode and was sold for $10 less. More on that here. Batman: Arkham Origins: Blackgate: Released on time for the 3DS, also on October 25, 2013. Deus Ex: Human Revolution: Director's Cut: Released on time for the Wii U on October 22, 2013. Disney Infinity: Released on time for the Wii, Wii U, and 3DS on August 18, 2013. Just Dance 2014: Released on time for the Wii U on October 8, 2013. Rayman Legends: Released on time for the Wii U on September 3, 2013. Scribblenauts Unmasked: A DC Comics Adventure: Released on time for the Wii U and 3DS on September 24, 2013. Disney Planes: Released on time for the Wii, Wii U, DS, and 3DS on August 6, 2013. Shin Megami Tensei IV: Released on time for the 3DS on July 16, 2013. Skylanders: Swap Force: Released on time for the Wii, Wii U, and 3DS on October 13, 2013. Splinter Cell: Blacklist: Released on time for the Wii U on August 20, 2013. Sonic Lost World: Released on time for the Wii U and 3DS on October 29, though it was delayed by one week. Watch Dogs: Missed its original Fall 2013 release date, as all versions were delayed to 2014. Currently, the Wii U version is slated to release in Fall 2014. The Promise: The following eleven indie games will be released on the Wii U eShop before the end of 2013. Ballpoint Universe: The Wii U version didn't release in 2013. It was later announced to be coming in April 2014, but it missed that date, too—there's no known release date at the moment. Cloudberry Kingdom: Released on time on August 1, 2013. Coaster Crazy Deluxe: Released on time on November 21, 2013. DuckTales: Remastered: Released on time on August 13, 2013. Dungeons & Dragons: Chronicles of Mystara: Released on time on September 5, 2013. Mutant Mudds Deluxe: Released on time on June 13, 2013. Oddworld: New 'n' Tasty: Missed its 2013 release date. It is currently slated to come out at some point after this year's E3. Scram Kitty & His Buddy on Rails: Missed 2013, released only on May 15, 2014. Shovel Knight: Missed all three of its original release dates (2013 September, 2013 Winter, and March 31, 2014). Currently in the process of being released, according to the latest Kickstarter update. Spin the Bottle: Bumpie's Party: Released on time on August 8, 2013. A World of Keflings: Missed 2013. Currently slated to arrive in 2014. The Promise: The Wii U HD re-release of The Legend of Zelda: The Wind Waker is coming out in October 2013. It will have Miiverse features. True? Yep, and the digital release even arrived earlier, on September 20, 2013. The retail version followed on October 6. Miiverse messaging with other players was done through the in-game Tingle Bottle item. Check out our review here. The Promise: The Wonderful 101, Platinum Games' superhero adventure, will come to the Wii U on September 15. True? Yep, it did. Our review can be read here. The Promise: A new Donkey Kong game, named Donkey Kong Country: Tropical Freeze, is coming to Wii U in November 2013, courtesy of Retro Studios. True? It didn't release in time, unfortunately. Tropical Freeze was first pushed back to December 6, and then delayed again to February 2014. It finally came out on February 21. You can find our review here. The Promise: Platinum Games is bringing the sequel to Bayonetta to the Wii U. It will feature a short-haired Bayonetta. True? Not yet, though there's a new trailer. The Promise: Monolith's open-world RPG, X, will be released on the Wii U in 2014. True? Not yet, but some more gameplay footage has been revealed since then. The Promise: Super Smash Bros. for Wii U and 3DS will be released in 2014. The games will include the Villager from Animal Crossing, the Wii Fit Trainer, and Mega Man as fighters. True? Not yet, but several more fighters have been revealed. We also know that the 3DS game will be released in Summer, and the Wii U game, in Winter. Alright, now that we've looked at Nintendo, it's really time to start getting into the E3 mood. Only a few more days!